From its earliest conception in the 1920s, the EMU was envisioned as a place for students to congregate; to study, relax, recreate, and participate in student-run organizations. Despite a two-and-a-half-decade gestation before a brick was ever laid, at least one misguided renovation, and an ever-evolving student culture, the vision has succeeded. Not only have the building’s larger spaces served as central meeting areas, but its smaller spaces—tucked away lounges, secluded meeting spots, and upper-level balconies—have served to comfort, nourish, and support thousands of students, and many employees, over the years. Today the EMU is undergoing an ambitious $95 million expansion and renovation, with student fees providing $90 million and the rest coming from alumni and friends of the university. Scheduled to be completed in 2016, the project includes the demolition of the 1970s addition, the renovation of much of the original 1950 building, and the addition of 80,000 square feet of new space. Architecturally compelling and well-loved spaces that serve as touchstones for current and former students, such as the Fishbowl, the Taylor Lounge, and the Adell McMillan Gallery, will remain, but a few favorite spaces, such as the pedestrian breezeway that ran under the building, were sacrificed to the new design. The EMU that opened in September 1950 was the product of a combination of vision, planning, delayed hopes, and patience. Eagerly supported by the university’s fourth president Prince Lucien Campbell and the classes of 1923-25 the likelihood of a student union at the UO faded after Campbell died in 1925 and subsequent administrations chose different priorities. Donald Erb, the university’s seventh president, took office in 1938, and according to the 2013 video Meet You at the S.U., Erb revived the dream of a student union, seeing it as a place that would accommodate veterans as well as “a place to practice democracy.” Erb’s advocacy was steadfast, but after the 1941 bombing of Pearl Harbor, plans for a student union were once again put on the back burner. No new buildings were constructed during the war years. When the conflict wound down, however, the UO’s enrollment more than doubled as a flood of vets returned to campus, and the need for a student union became undeniable. Students caught the wave of renewed interest, forming a Student Union Committee in 1944. The following year, the university approved a plan for the construction of a student union to be financed by student fees and outside donations. The State Board of Higher Education gave the plan the go-ahead, preliminary plans were drawn up by 1947, and the UO’s largest fundraising campaign to date—led by alumni Ernest Haycox ’23 and John MacGregor ’23—was soon underway. Ground was broken in 1948 for the new building at the corner of 13th Avenue and University Street—formerly the site of a two-story farmhouse built by pioneer Fielding McMurry, whose brick-making business had supplied bricks used in the construction of the UO’s first two buildings, Deady and Villard Halls. The student union building was completed two years later, at a cost of $2.1 million. It was named for Erb, who had died in 1943, and dedicated to all students who had served in the armed forces. 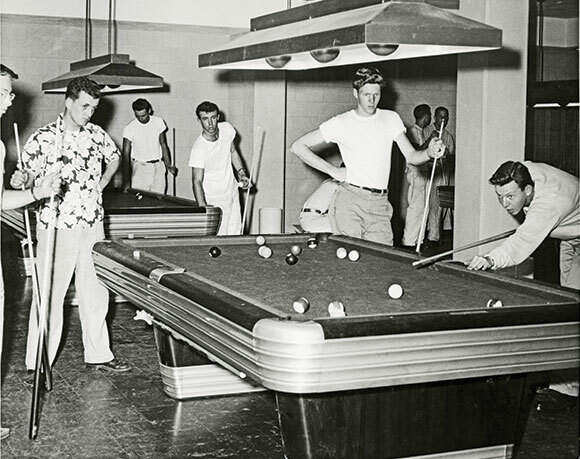 In addition to its modern aesthetics, the union offered students a host of amenities. The ground floor included a four-chair barbershop, a post office, an eight-lane, state-of-the-art bowling alley (25 cents per person per lane before 6:00 p.m., 30 cents after); 10 billiard tables (60 cents per hour before 6:00 p.m., 75 cents after); and seven Ping-Pong tables (15 cents per hour). In the bag-lunch room, students could rent a locker for 10 cents a term to store lunches they brought from home. Two listening rooms allowed students to listen to classical or jazz recordings. Budding pianists could hone their skills in the piano practice room. The building quickly became the center of student activity for the burgeoning campus community. “There were plenty of spaces for people to meet and congregate,” says Pat Dignan, 1952–53 ASUO president. What he remembers most is the office—and the secretary—that were reserved for the ASUO president. “I was pretty impressed with that. It was the first office I ever had,” he says. His salary was $73 per month; the secretary was paid half that. The student government offices were eventually moved to the ground floor of the EMU. Emma Kallaway, 2009–10 ASUO president (with Getachew Kassa), says a small closet outfitted with a table and a couple of chairs in the student government office was hugely important to her tenure as president, and to her growth as an individual. In the building’s original conception, the ballroom was intended to be the heart of the EMU. From the lobby, students walked up a grand staircase made of green terrazzo to a room that could accommodate a thousand people. The sprung dance floor made dancing easier on the feet, and students took advantage. 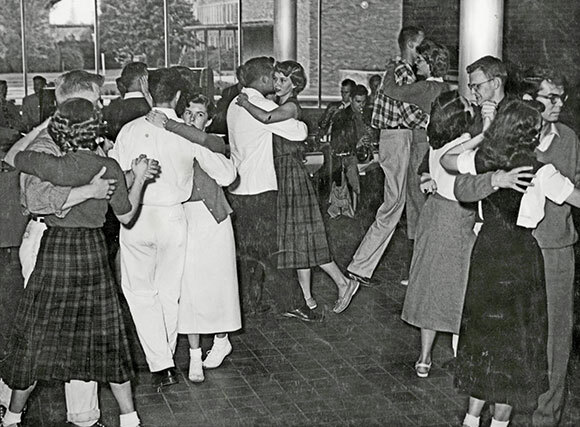 Throughout the 1950s, the ballroom was a focal point for social activities—from big bands to student-hosted parties. Suzanne (Brouillard) VanOrman ’61 had her first volunteer job at the EMU playing jazz records in the listening room. Her second was selecting movies for Sunday afternoon screenings in the ballroom. She remembers a toga party EMU staff members held in the ballroom to thank volunteers. “We all dressed in sheets. Si [Ellington, the EMU director] had a wreath ’round his head. It was crowded and there was a lot of good food.” The party raised eyebrows and created a bit of a buzz. “I’m not sure if they ever had another one,” she says. Mike Kraiman began working in the EMU in 1978 and never left. Today he’s the technology administrator and scheduler for the building, but the ballroom is the area closest to his heart. “I’ve spent a lot of my life there. The ballroom is my space,” he says. In the late ’70s, the ballroom was one of the few venues in Eugene where music groups could perform for large audiences, and his job was to manage lights and sound during the shows. Kraiman eventually mastered the lights, and the sound. He began keeping files on the various groups who performed in the ballroom—Los Lobos, R.E.M., Talking Heads, the Ramones, Dennis Quaid and the Mystics, even a surprise performance by Bob Dylan. Kraiman still remembers Iggy Pop’s gig in 1983, when the rocker threw the microphone stand into the crowd, along with pieces of raw chicken. For the past several years, the office of Laura Fine Moro, a contract attorney for the ASUO Legal Services, has been located in a former storage closet near the ballroom. Because her office has no heat or air conditioning, she keeps the door open. She’s watched a jazz dancer work for hours to perfect a performance piece, observed dressed-to-the-nines high school students giddy with excitement at participating in a mock UN meeting, and students napping on a bench outside her door. “There’s never a dull moment,” Moro says. “Mostly it’s delightful seeing the whole population of the university pass by me—in protest, in prayer, in pursuit of knowledge, or providing entertainment.” Her office was moved in June to accommodate the renovation, and she wasn’t looking forward to the change. The free speech platform outside the EMU has been one of the most energetic spaces connected with the building. In 1961, a speaker named Homer Tomlinson, who proclaimed himself “King of the World,” was heckled by students while orating from the Fishbowl terrace. According to A Common Ground, a history of the EMU written by former EMU director (and gallery namesake) Adell McMillan, the audience’s intolerance prompted an angry response from UO president Arthur Flemming. 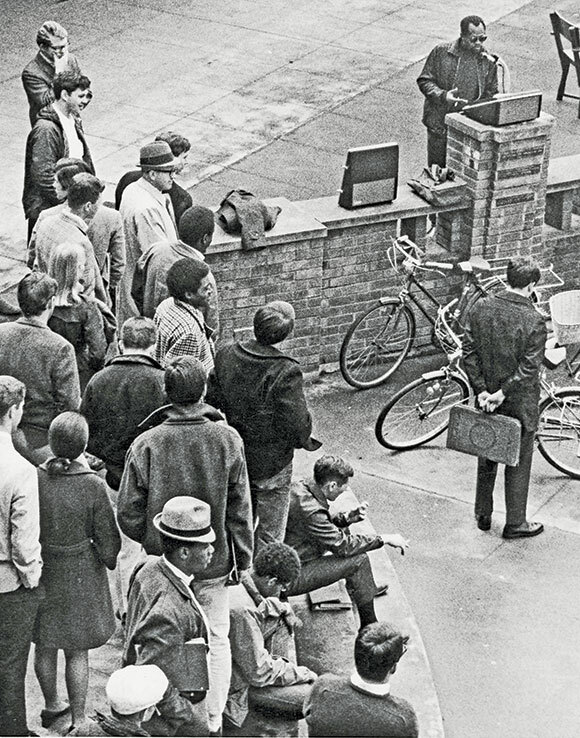 The Student Union Board decided to erect a free speech platform on the terrace, with a quote reading, “Every new opinion, at its starting, is precisely in a minority of one.” The wooden platform was later replaced with a permanent brick podium. Few could have imagined the role the platform would play in just a few years’ time, when politics, social change, and student unrest hit the university like a lightning strike. The draft was compulsory, and it had become a very real issue for male students. “It was not an empty discussion. People were forced to make a hard decision, forced to act. The discussion on the free speech platform was that some people were going to die, and some were going to prison,” says Morgan, who was himself sentenced to six years in prison for disrupting the Selective Services offices in Eugene and Roseburg. He served six months before being released. Since then, Morgan has worked in logging, ranching, and general contracting. During those tumultuous years, the EMU was the focus of protest rallies and demonstrations, including a 24-hour sit-in. In January 1969, protesters harassed naval recruiters and burned their recruiting materials. A few months later, students erected shacks on the EMU lawn and invited homeless people to live in them. In a controversial decision that raised hackles around the state, UO acting president Charles Johnson allowed the shacks to remain for two weeks. Despite the spacious charm of the ballroom, and the political intensity of the free speech platform, the EMU space remembered most frequently and fondly is the iconic Fishbowl. 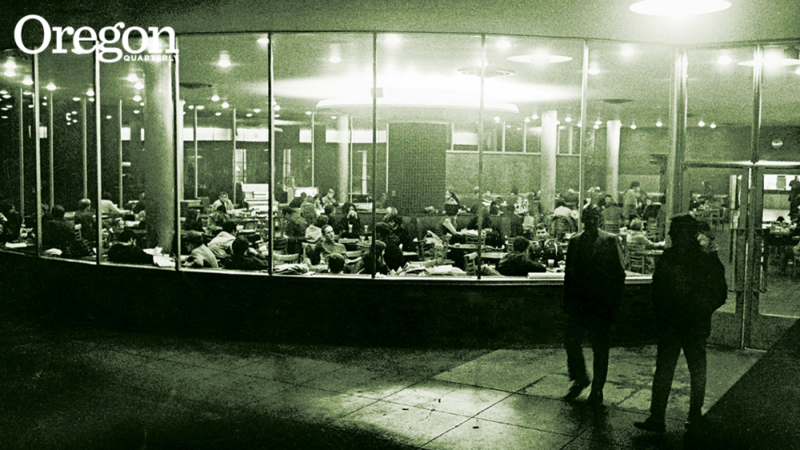 Years before it was featured in the 1978 film Animal House, the curved glass Fishbowl had become the center of student interaction on campus. “That first year, I was over there all the time, hanging out, playing cards between classes,” says Dignan, the 1952–53 ASUO president. “It was new and exciting, a place to go and meet people.” Drummonds recalls that rather than put up with his aggravating roommate, he would park himself in the Fishbowl. “I could block everything out—the noise and the music—and study. 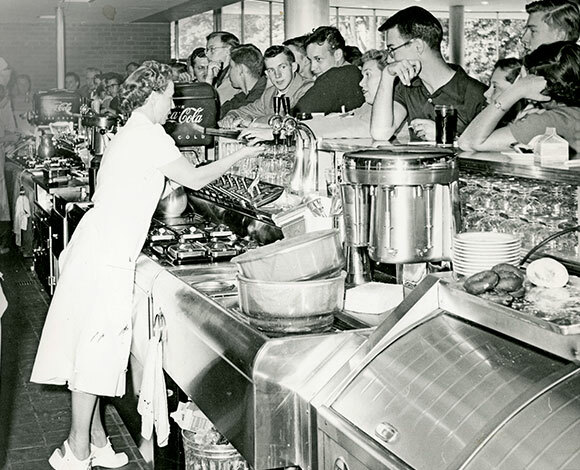 I loved the Fishbowl space.” Joe Leahy ’65 remembers spending Friday afternoons during his senior year at the Fishbowl, reading the Register-Guard and sipping coffee. “It was a quiet moment at the end of the week,” he says. Renovation plans call for the Fishbowl to retain its original character—including the distinctive bank of windows that inspired its name—even as it receives updates including new floor and ceiling tiles, modernized food service setup and lights, and renovated restrooms. Chong and other EMU employees are excited about the “new” EMU. She’s excited about the small changes—such as having updated circuit breakers that won’t blow during nighttime study hours and the reinforced south lawn that won’t turn into a muddy bog after heavy use. Kraiman says he never had much affection for the ’70s side of the building, which he felt lacked the structural integrity and class of the original building and its materials. “Every time I see [demolition crews] taking more swings at the building, I go, ‘Yeah!’” he says. As a member of the EMU board, Miles Sisk, the junior who considers the EMU his second home, has for the last two years participated in planning the building’s renovation. He’s psyched about the changes—replacing the ’70s building with a more energy-efficient structure, technology upgrades, and new food venues, and the large screens that will hang in the lobby to show student-produced videos. But what really excites him is the effect the remodel will have on students. Alice Tallmadge, MA ’87, is a local freelance writer. Her lingering memory of the EMU is eating taco salads while reading the Daily Emerald in the Fishbowl.